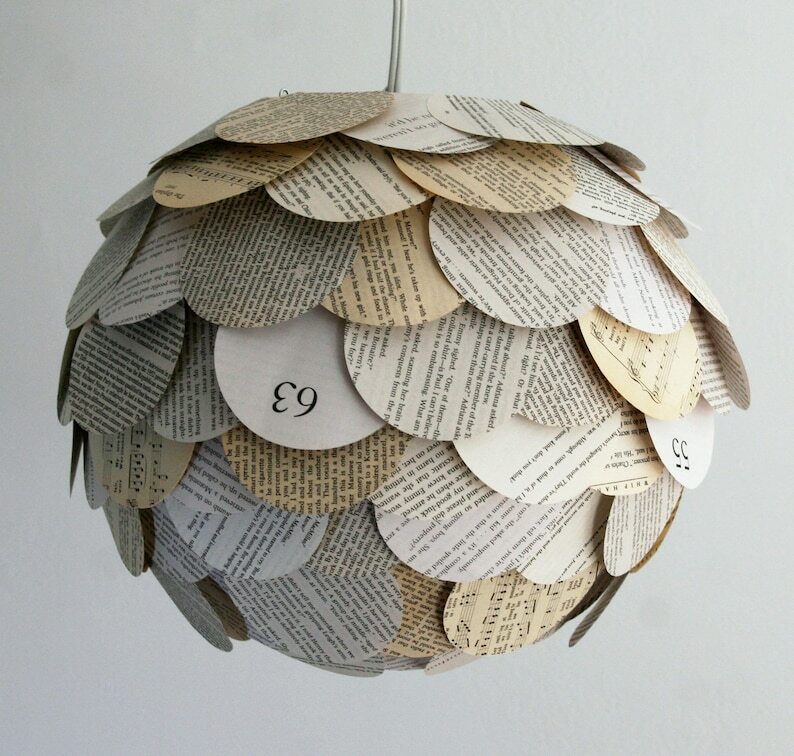 The Manhasset Collection's Mixed Book Page Pendant is a fun pendant lamp shade is created by applying circular pieces from assorted paperback books to a round paper lantern. The shade glows warmly when lit up, allowing a decent amount of light through the layers of paper. Each pendant features a variety of white, gray and tan pages. 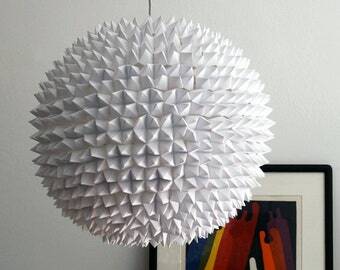 We are the original creators of these paper shingle artichoke pendant lights, don't get fooled by any copycats here on Etsy, buy from the original designer! These are absolutely incredible. Words don't do them justice. A beautiful shade. The colors are vibrant and the construction is sturdy. Thank you. For change of heart returns you will be responsible for both original and return shipping costs but will receive a full refund for the item. Items must be shipped back within 30 days, and we are not responsible for any damage that occurs while the item is shipped back to us. We love doing customized orders. 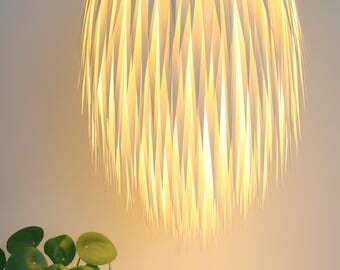 Some of our lights can be made in customized sizes, and some can have their color or paper material customized. If you are interested in something special, please send us a message with as much info as possible about what you had in mind, and we will get back to you with feasibility and pricing as soon as we can. To clean the Manhasset collection lights, use a dry cloth and wipe down from top to bottom. Don't worry about pressing down on the petals, they will bounce back into place when you are finished. To clean the Dakota collection lights, use a can of compressed air to gently blow the dust off. You can buy a can of compressed air at any office supply store or online. For the Beaumont collection, you probably won't find that your light is collecting much dust, but if you do need to clean it simply use a can of compressed air to gently blow the dust off. You can buy a can of compressed air at any office supply store or online.